My three young children, a posse on their own, happily expanded their whirlwind to include their California cousins last week for several days of mountain scrambling, river splashing, family dinners, and endless giggling. Checking out the catch of the day. The suburbs of Sacramento are a far cry from the country lanes and cool rivers of Franconia, New Hampshire, and the planned slate of White Mountain activities was filled to overflowing before the plane touched down in the Granite State. In the four summers that my brother, a New Englander both by upbringing and at heart, has been returning “home” with his son, they have developed a few must-do items that are repeated each visit, along with a few new adventures every year. 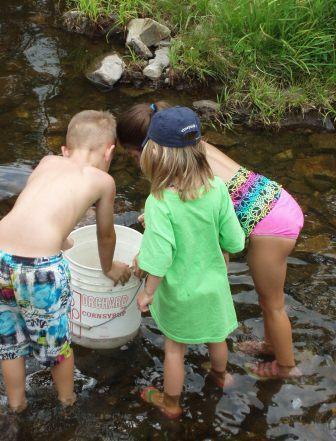 The week in New Hampshire is a chance for my brother to give his son – and now his two vivacious step-daughters – a glimpse into his own boyhood summers. It is a chance for the kids – all aged 10 and under – to form bonds and explore new things. The visitors get a taste of mountain living, being able to wander far and wide without the constant buzz of traffic, exploring dense forest right beyond the backyard, watching fireflies and stars in a night sky not obscured by city lights. The kids who live here year-round are inspired to go to some of the places that draw tourists here, but that we don’t think to visit because they’re simply part of the local landscape. During past summers, we’ve ridden the tramway at Cannon Mountain (normally a winter activity for us, but just as spectacular in the summer), watched the bears perform at Clark’s TradingPost, joined the throngs of small kids and their families at Santa’s Village, and browsed the world’s longest candy counter at Chutters. This year, as always, we began the week with the short trek to the top of Mount Baldy in Franconia Notch. This is my nephew’s favorite, and we don’t do anything else until we’ve scrambled over the boulders of Baldy to reach the breezy top and check out the view of Lafayette and the Peabody Slopes at Cannon. From there, we moved on to more fun – and kept right on moving the entire week. We slid down the chutes at Slippery Rock, paddled the waters of Long Pond and Coffin Pond in canoes and kayaks, splashed happily in chilly Echo Lake, and squeezed through tunnels and caves at Lost River. The kids hunted crayfish, dug in the sand, and watched a bear wander slowly across a ski trail high above the beach at Echo. At Long Pond, a lone loon braved the noisy bunch, floating near the canoe and then diving underwater to reappear in a new place, and every rock turned in the outlet stream revealed a salamander. At Coffin Pond we watched a heron fly over us and a painted turtle slip from a log into the water as we glided near. Even at home, there was nary a dull moment. Soccer in the yard, searching for toads and inchworms in Nana’s gardens, finding green sticks with Poppy for roasting marshmallows, swinging on the old Peabody chairlift hanging behind the house, impromptu dance parties around the fire pit with Aunt Laura, and back-to-back-to-back evenings of gobbling up s’mores and watching fireflies. It was everything summer should be, squeezed into a mere six days. As the cousins headed back to the other side of the country this week, we were all sad to say goodbye. Their visit left us a bit tired and filled with happy memories – and a list of things to do next summer. Let the countdown to next year’s cousin reunion begin! Ahhhh, summer vacation. That time of year when school teachers everywhere breathe a sigh of relief, students run out the schoolroom door toward sun and fun, and parents rejoice in not having to rouse children and pack lunches in the wee hours of weekday mornings. Except that, at least for us parents, summer is a mixed bag. Along with the happiness and sunshine comes a niggling sense of panic at the thought of having to entertain our children all day – or find someone else to do so. During the carefree (ha!) days of summer, we enjoy extra time with our kids, but any sense of a “normal” schedule is dashed as we squeeze summer into already busy days. It may not be all rest and relaxation, but if you do it right, summer is still a groovy change of pace. It’s been many years since my school days and the associated laid-back time of summer break. Still, every year as June rolls around, I look forward to the down time of summer, even though now, summer often seems a blur of activity. I’m a stay-at-home parent, but also a work-from-home parent. Daily life during the school year involves juggling class field trips and cooking dinner while scheduling meetings with clients and time for work. That process is confounded during the weeks of summer, as we work in trips to the pool and the river, time with visiting family, gardening, and summer sports. I’m a morning person by nature and, now, by necessity and am usually up and at ‘em by 5:30, to squeeze in a bit of work, a morning run, a load of laundry, maybe a little reading, and – if I’m lucky – one quiet cup of coffee. Alone. With the early brightness of almost-summer mornings, it’s easier to get up and go, and I find myself working both earlier in the mornings and later in the evenings, as the daylight lingers. 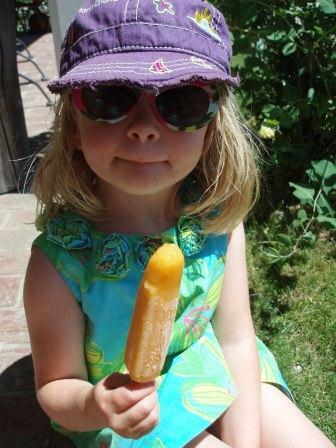 That frees up time during the day for all that summer fun! With a warm spring that is heating up toward the solstice, we’ve already snuck in plenty of summer activities. We’ve visited two of our favorite swimming holes along the river, taken a couple of trips to the pool, and savored afternoon popsicles and dinners al fresco. The summery scents of sunscreen and bug spray and smoke from the grill already permeate the air. Still to come… the beach, golf and tennis lessons, time with friends, a vacation near the ocean, scrambling up our favorite local hiking trails, parades, s’mores cooked in the fire pit, catching fireflies, canoeing, mini golf, and visits from the cousins who live where the real heat is – California and Tennessee. Ahhhhh, summer; who has time for lazy days when there’s so much to do! It is graduation season, and the predictable beat of Pomp and Circumstance resonates from school gymnasiums as students everywhere march toward the next phase in their lives. 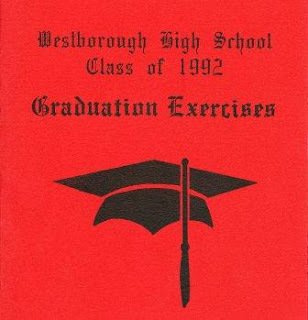 Last week marked the 20th anniversary of my high school graduation. Next week my two oldest children will “graduate” from preschool. All around our region this month, students are making transitions – from middle school to high school, high school to graduate, college student to work force. I have only a vague, time-warped memory of my high school commencement – a white polyester gown to go with the tasseled cap, friends and family gathered, the rain that moved the ceremony from the football field to the gym at Westborough High School. In an attempt to recollect my thoughts of that day, I dug out my old journal last week. The entries surrounding graduation are filled with the words of mixed emotions: excitement, fear about the unknown future, disbelief that the first 13 years of my schooling were coming to an end and that I’d soon be leaving the only town I’d called home for a college six hours away. What struck me most as I read those words two decades after writing them – beyond the revelation that I once had such neat penmanship – was the anxiety that seemed to overshadow the celebration. It reminded me that graduation – whether from preschool or middle school, high school or college – marks both a beginning and an end and is both celebratory and wistful. Like any major life change there’s likely something worth holding onto in the old and something wonderful to look forward to in the new. The trick is that you may not realize what those things are at the moment of transition. Two years ago, as I prepared to send my children to school for the first time, I was torn between the freedom preschool would allow me to do more work, to regain a small sense of flexibility, and the terrifying knowledge that I was delivering my children into a world completely unknown to them. I was a mess of nerves as I shepherded them out the door toward that first morning, and by the time we’d loaded up the family minivan for the short drive to school, I was shaking. Partly I was anxious for these shy, reserved, precious babies who had never been cared for by anyone other than their parents and grandparents. And partly I was conflicted between wanting them to go and wanting them to stop growing up so dang fast. My little boy, who had eyes only for Mama, jumped right in, with barely a backward glance to see if I was still there. For my little girl, who is strong in so many ways, the transition involved lots of tears, plenty of drop-off clinginess, and my heart breaking a little bit every day. The preschool my children attend is amazing, with great teachers, good kids, and lots of exploration of both ideas and the world just outside the schoolroom door. When you’re 3- or 4- or 5-years-old, school is a fun adventure, a combination of short bursts of focused learning, blissfully messy art projects, and playing with friends. For the lucky students, schooling – and life in general – remains an adventure, an exploration, a joyful experiment. Of course, there are also tests, long papers to write on topics that may not captivate you, teachers you might not get along with, and homework, just as in life there are challenging projects, difficult co-workers, and too-long days on a stressful job. I’m more than twice the age I was when I graduated high school, with 20 more years of living added to my resume of life experience. And my preschoolers are nearly kindergartners. They can count to 100 – by ones or tens – and spell their names in uppercase and lowercase letters. They’re learning to read. They can pump on the swings and hit a baseball off a tee and ski expert runs. They’re still shy and reserved among people outside their inner circle, and silly beyond belief with those they know and trust. Next year, they’ll probably be a little timid at the start of kindergarten, in “the big school,” and I imagine I’ll be a bit of a wreck, again, on the first day of school. It won’t surprise me if I shed a tear or two as my children once more enter an unfamiliar world with new people and new rules, the next phase in the long process of growing up. But they’re excited, too, and they’ll figure it out. Just as the kids moving up from 8th grade will learn the ropes of high school. Just as the ones graduating from the high school or college this spring will bask in the glow of accomplishment and the excitement – and uncertainty – over whatever comes next. No matter if you’re a 5-year-old starting off in a new school, an 18-year-old moving beyond the familiar parameters of high school, or a parent watching a new phase unfold for your child, the change marked by graduation can be both scary and exciting. But we usually adjust, and with a little luck and some work hard, we can grow and thrive. At the end of my first college semester I had achieved the two big goals I’d had - earning good grades and a spot on the varsity soccer team (where I did a fabulous job of warming the bench) at Ithaca College. From the old familiar comfort of home, between semesters, I added these words to my journal: “I nervously moved away from all that was familiar and secure and jumped head first, anxiously into the world between childhood and adulthood known as ‘college.’ I have met so many new people and friends and have continued to grow and learn.” Life after graduation, it turned out, was pretty good. To everyone graduating this year, whether from preschool or high school or college or anything in between and beyond – congrats, good luck, and here’s hoping you love the life you find as you move on. A version of this essay appears in the Record-Littleton this week.